While launching 2019 with one of our busiest months ever, our team has also been strategizing new objectives and key results for Crossroads and our clients. This annual goal-setting process got a major upgrade this year after we studied John Doerr’s new book, “Measure What Matters”. 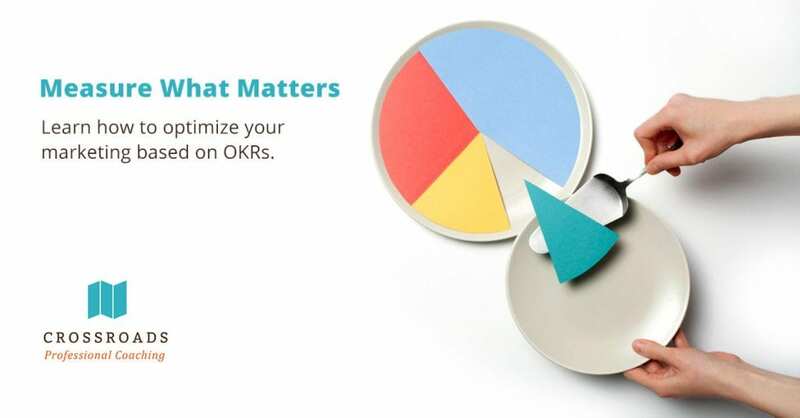 In his book, Doerr outlines a system for setting, measuring, and improving company OKRs (objectives and key results) that has worked for Google, Intel, Under Armour, and many more. Naturally, I began to apply OKRs to our current projects and tasks as I read about this new process and the corresponding success stories. At first, it was a little overwhelming. I have a tendency to get lost in the weeds sometimes daydreaming about these things, so I had to pull myself back to earth and realign myself with our main company objectives. When you have main objectives set, they can be used as an easy reference to help you make time and asset management decisions. So, as I peruse last year’s analytics in order to develop this year’s plans, I thought I would share with you my thinking process. What is the most important metric in measuring any marketing tactic? Conversions. Or rather, conversion rate, as we will go into further. CTR, CPC, reach, impressions, etc. can be powerful indications of reaching your target audience effectively, but they count for naught if you’re not getting conversions. We can back up even further by examining what an actual conversion is: an action a prospect (such as a user on your website) takes to become a customer or lead. Depending on the client, we have anywhere from 3-15 different marketing tactics currently being managed. These can include blog and email marketing, social media posts, Facebook/Instagram ads, Google display ads, SEO optimization, and more. At the end of the day, the client does not need to know every data point from every marketing channel. They need the cliffs notes version of the data, what is converting, and opportunities. It turns out that those are also the only main ingredients we need as marketers to deliver on results. However, the little details will always have their place and are the building blocks of the overall marketing strategy. Internally, we may drill down even further by separate campaigns, but for the bottom line, we usually are safe by using those categories. We have been using the following framework in order to analyze our main categories and as a guide to focus on what really matters: conversions. 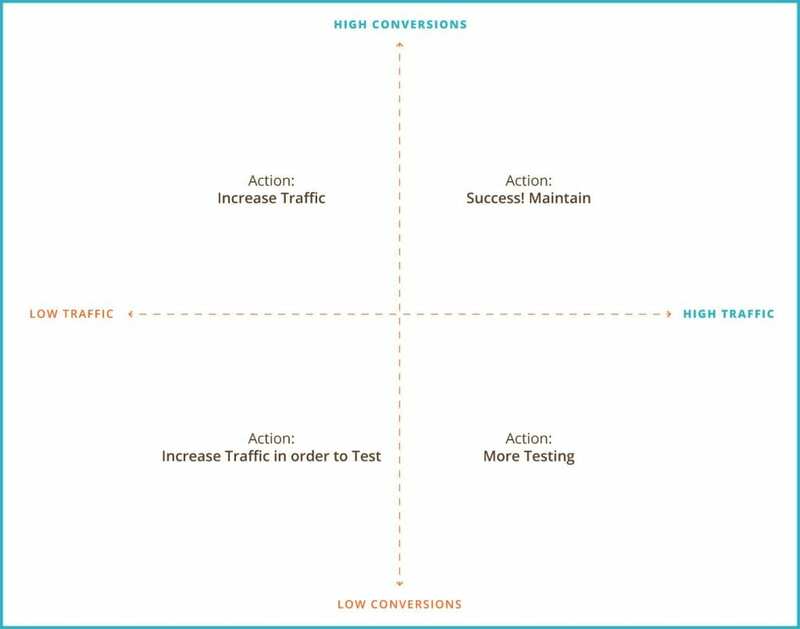 Judging each marketing effort based on those two objective variables allows us to easily identify actions to take that will improve results and get in that glorious top right quadrant. Basically, if it is converting at a high rate, increase investment! If it is getting a lot of traffic, but not yet converting, head to the lab and experiment with audience targeting and ad creative. If you are not getting any traffic or conversions, it’s time to hit the drawing board. You’ll need to increase traffic to a substantial enough amount in order to accurately gauge performance. Lastly, if you have maxed your budget and are firing on all cylinders, keep that train rollin’, you’re doing alright. This analytical phase of marketing is my happy place. Optimizing marketing and advertising campaigns can be overwhelming at first, but when you can break things down to their core purpose and realign your strategy with overall company objectives, you will always be on track. The result of this new clarity in your marketing efforts will increase motivation and lead you to the results you’re looking for much quicker than trying to analyze everything on a whim without organization and prioritization. We’re here to help. If you have been meaning to get your marketing off the ground and converting for your business, give us a call. We would love to sit down with you to discuss your business goals and how we can help you get there. As a Marketing Project Manager, Shelby's goal is to provide value for clients with results-driven solutions in website development, digital advertising, and traditional marketing collateral. Nice post, Shelby. John Wanamaker once said, “Half the money I spend on advertising is wasted; the trouble is I don’t know which half.” But with today’s digital marketing we can measure the exact conversion rate of each marketing campaign. This should be a top priority for every organization so it can see what’s working best and make the most of their marketing resources.